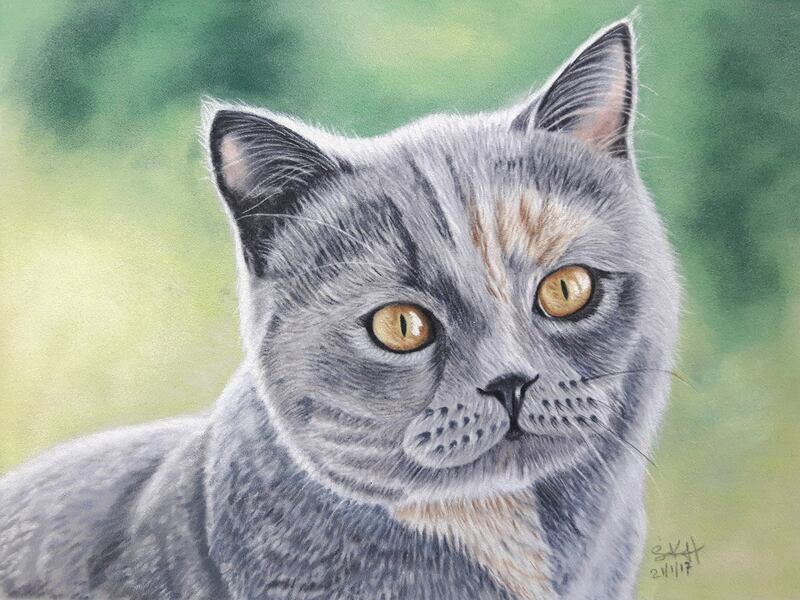 My customer asked me to paint a cat portrait of her gorgeous cat Gracie, a British cream and blue short hair cat. My husband adores our cat and so, when I was thinking about his birthday, I knew immediately that I Sue could create for him a perfect portrait of our darling little Gracie. I provided Sue with the photograph of her that both my husband and I love and she took it from there. With her amazing talent, Sue created a portrait that captured Gracie perfectly. You can even see the flicker of naughtiness in her eyes. Sue and I worked together to get the colours just right for Gracie’s coat (there is a gingery tone that wasn’t very evident in the photograph – but Sue got it perfectly in the portrait). My husband was blown away when I presented him with Gracie’s custom cat portrait. It is just one of the best pastel portraits of a cat I’ve ever seen. Sue is phenomenally gifted. I was so impressed, I shared the portrait and the information about Sue with members of an online group of cat owners. I wouldn’t hesitate to recommend Sue. She is so helpful and she kept me up-to-date as she was working on the portrait, sharing the image as it evolved! Neither my husband nor I could be more pleased or thrilled with this incredible work of art. You might like to read my blog post about Gracie and how i created her cat portrait.